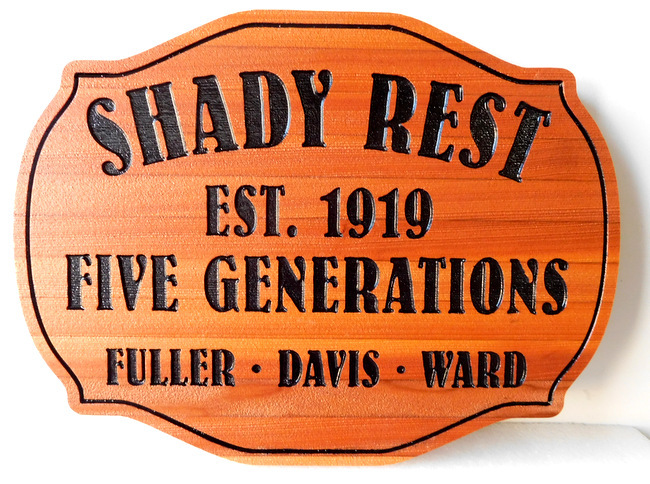 M22011 Western Red Cedar Engraved Plaque "Shady Rest, Five Generations"
This naturally finished (no stain) Western Red Cedar property name sign "Shady Rest, Five Generations" has engraved text and border. The entire sign is given two clear-coats to protect it from UV radiation and the weather. This sign can be mounted on a interior or exterior wall, a post, or hung from a wrought iron scroll bracket or beam supported by two posts.